As it exists today, the fabric of the east and south walls of the Guild Chapel’s chancel may date in part to the 13th century. We are not sure when the hospital ceased to exist, but we do know the chancel and north wall were re-modelled around 1450, and that the nave, porch and tower you see today were added around the 1490s, funded from a bequest in the will of Hugh Clopton. Most of the wall paintings also date from this time, also funded by Hugh Clopton’s will. By the end of the 15th century, the Guild had become the town’s semi-official governing body. But the reformation was its undoing. King Edward VI suppressed all the guilds in the kingdom in 1547, and confiscated their property. In Stratford, it was the end of an era. The Guild was abolished, but the King still needed people he could trust to run Stratford from day to day. So, in 1553 he issued a Royal Charter of Incorporation to create the Corporation of Stratford. The town corporation was granted ownership of the Holy Cross Chapel. The Chapel has been through several transformations since then – we know for example that early in the 17th century it was divided up, with the chancel partitioned into tenanted chambers. In 1804, a major refurbishment was undertaken, at which point the medieval wall paintings were discovered – but then re-covered. 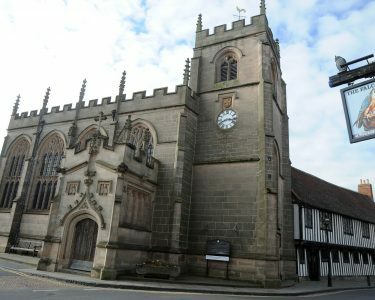 In the 20th century, further major works were carried out, funded by the Friends of the Guild Chapel at a time when the building had fallen into significant disrepair. 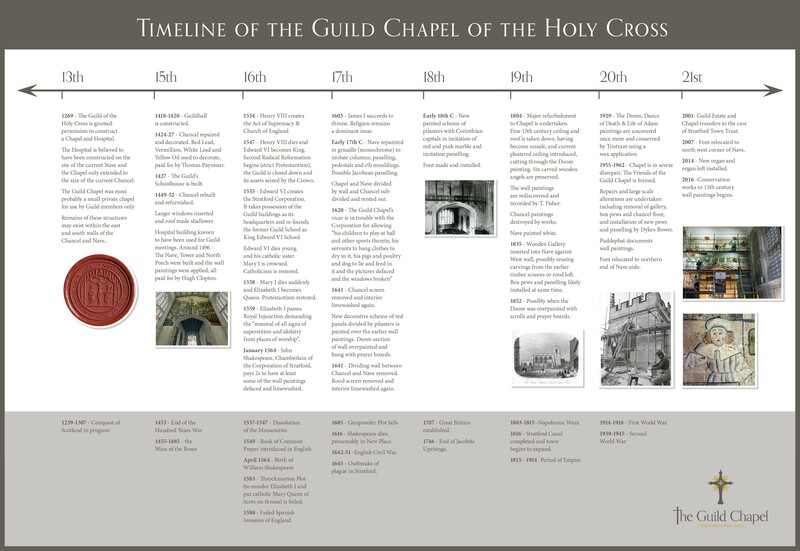 Please click on the link to view our Guild Chapel Timeline for more information.